I received some wonderful gifts this year for my 15th birthday, and I thought I would share them with my friends on the Alzheimer’s Reading Room. First, the wonderful birthday message from Bob started my day off happily. I am very glad to have Bob’s support behind the Springbok PuzzlesToRemember. As he said, the feedback we are receiving on the puzzles is very positive. Readers believe they are beneficial to Alzheimer's patients. 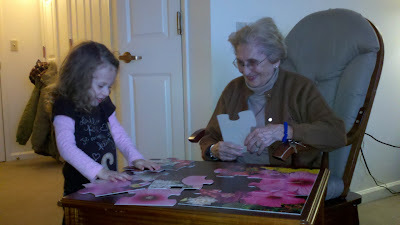 Here is a photo of an Alzheimer’s patient and her granddaughter working on Blossom Bouquet. The smiles say it all! The sense of pride is evident on the faces of the young and old. 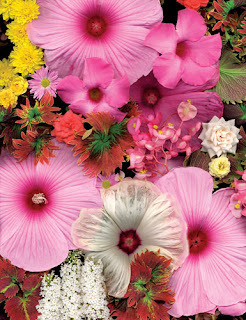 These specially designed puzzles come in both 12 and 36 pieces. In the image above, the patient is working with a 12 piece puzzle, and it appears she is really enjoying herself. The pieces in the 12 piece puzzles might seem too big to those of us that are use to traditional puzzles; however, we know from the feedback that they are very effective with patients in later stages of Alzheimer's and dementia. Bob and I have discussed this. We feel that caregivers might be biased toward the 36 piece puzzles because of the way the 12 pieces look to them. The pieces are very large. However, considerable thought was given to making puzzles that are effective and doable by any and all Alzheimer's patients. Don't assume that just because the pieces are large that this makes the puzzles too easy. Please don't get the idea that advanced stage patients can't or won't do the puzzles. Advanced patients are receiving great satisfaction and are succeeding with the 12 piece puzzles. Just remember there is "more there than you might think". You might find this excellent article by Judy Dearing (Chrissy's Moments) of interest -- Alzheimer's Disease Moment, You Know I Don’t Work Puzzles. Judy didn't think her mother would do the puzzles either. You'll have to go to the article to read about all the "twists and turns" and the outcome. I received another wonderful gift. I am now the youngest member ever (albeit “honorary”) of the American Association of Geriatric Psychiatry. I was extended this free membership by the President of the Association! This gives me access to their online journal, containing the most recent research in the field. It also makes me eligible to attend their annual conference. I also want to thank all the readers of the Alzheimer’s Reading Room for the nice messages they sent. I can only strive and hope to live up to your expectations for me. Still another birthday surprise came by phone message. I have been invited to a very exciting event in New York City. However, I’m not yet allowed to divulge the details. You can be sure I will let you all know about it as soon as I get the “go ahead”. I hope I can use the event to spread not just the cause of PuzzlesToRemember, but also to bring attention to the needs of Alzheimer’s caregivers. Thank you all, again, for your encouragement. And thank you, Bob, again, for never wavering in your support of those facing this disease. Here is a good example of a Springbok PuzzlesToRemember. These puzzles are specifically designed for persons suffering from Alzheimer's, dementia, and memory loss. They can also be used to exercise your brain.